From the Spider-Man collection by ICUP. Spider-Man Ice Cube Tray. This Item is in stock and ready to ship. 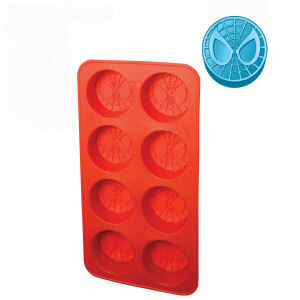 You should not postpone your purchase and miss out on adding Spider-Man Ice Cube Tray to your Spider-Man collection! From the Spider-Man collection by ICUP. Spider-Man Ice Cube Tray. Makes Eight Spidey face ice cubes at a time. Not microwave safe. Hand wash only. Not dishwasher safe. Measures about 9 Inches long by 4.5 Inches wide. ICUP Spiderman Household Items shipping from Canada. No Surprise Border fees or Customs!